A UK design consultancy has teamed up with a giant Chinese manufacturer to produce what they say is the world's most affordable solar lamp. 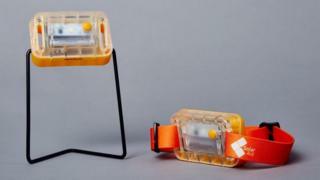 Manchester-based firm Inventid designed the SM100 solar light, which retails for $5 (£3.85) in African countries. It was developed in collaboration with China's Yingli and charity Solar Aid. The hand-sized lamp runs for eight hours when fully charged. As well as a stand, it has strap slots so it can be used as a head torch or tied to a bike. The SM100 was trialled with 9,000 families in three African countries, Malawi, Uganda, and Zambia, and the new light is now on sale. Kerosene burning lamps remain the sole source of lighting for some 600 million people living without electricity in Africa. But they are expensive to run and there is the constant danger of potential fires. "Kerosene keeps families locked in a cycle of extreme poverty with almost one quarter of their monthly income spent burning the fuel," explains Inventid co-founder Henry James. "To break this cycle we worked with Solar Aid, the UK's leading solar charity to design a light that the poorest families could afford. This meant designing a light that could retail for $5 in Africa." Inventid, co-founded by Mr James and Bryn Morgan in 2012, worked closely with charities in Africa to develop the light. "We gathered local insights into family routines, the layout of dwellings and environmental conditions. We listened to the aspirations and ideas of people whose personal experiences have shaped a product that is co-created in Africa," Mr James said. "We are talking about parts of the world where people live on $350 a year. "We have never heard of a sales trial this so far-reaching. It had to be totally right if people were going to adopt the light, and introduce it into their lives and their daily routines." Earlier this year, the SM100 won a silver award in the design for society and design for sustainability categories at the European Product Design Awards.